I’m excited to announce I’ll be performing with the Boulder Laptop Orchestra this evening. Boldly going where no laptop orchestra has gone before, BLOrk integrates technology with performers in an ensemble setting, providing live interaction between the two. Techie performers equipped with laptops, tablets, smartphones and a variety of control devices, play alongside live vocalists as well as alongside musicians playing acoustic instruments. 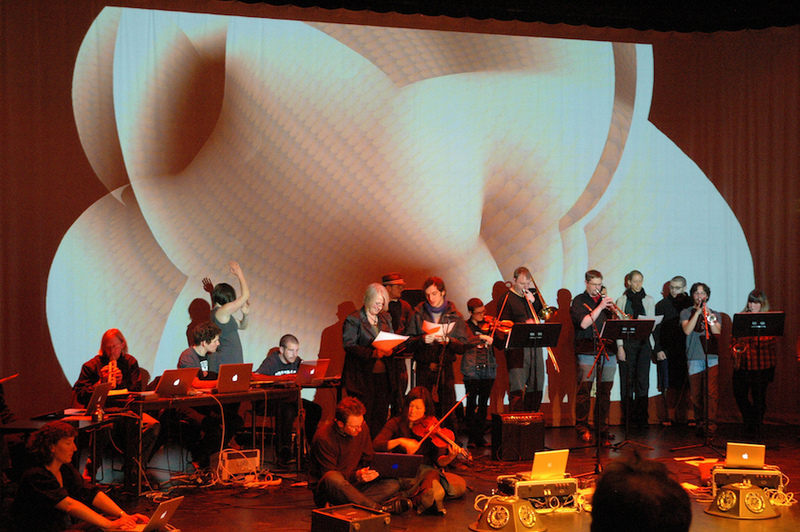 The ensemble, which is housed at CU Boulder’s Center for Music, Art, and Performance, performs original music as well as seminal works in the history of electronic music. BLOrk will be joined by special guest Mark Mosher, a sound designer, experimental multimedia artist, and music technologist from Louisville, CO. While performing locally and at events across the country, Mosher has been demystifying synths & inspiring people’s “inner sound designer” for over 10 years though his blog. Mosher will be providing live interactive visuals for BLOrk using real-time synthesis with live camera input as well as performing a solo musical piece of original Krell-inspired electronic tonalities. Founded in 2008, BLOrk uses hemispherical speakers which project the sound in a way similar to that of an acoustic instrument, creating a unique sonic experience. The ensemble builds on the research of the Princeton Laptop Orchestra (PLOrk) and the Stanford Laptop Orchestra (SLOrk). More info on Mark Mosher at http://MarkMosherMusic.com.